Back in March I told you guys what I was currently reading, my favourite bloggers and one stand out book for that month. Today I thought I’d update you on my current reads. I read a variety of different blogs, it allows me to gain inspiration and helps me to relax. I have watched Estée’s YouTube videos for a very long time now but only in the past year have I discovered her blog. Her bubbly and very friendly personality comes through in her writing the same as it does in her videos. I love her unique style of photography and her reviews are spot on every time. Idle lane is a blog created by Danielle Peazer. I have been following Danielle on Twitter for quite some time now, the London based dancer has recently set up her fashion and beauty blog, and fitness youtube channel. I love her style of fashion and her outfit posts are my favourite, I take a lot of fashion inspiration and tips from her. Olivia’s blog is one of my all time favourites. I followed Olivia on instagram before I discovered her blog, her photography on both her instagram and blog are stunning. Her baking posts are my favourite, they inspire me to try new things and to start baking again. Luce from Bonjour Luce creates simple but very beautiful photographs for her blog. I always look forward to seeing new posts from Luce on my bloglovin feed, her posts are so easy to read and are cery casual. 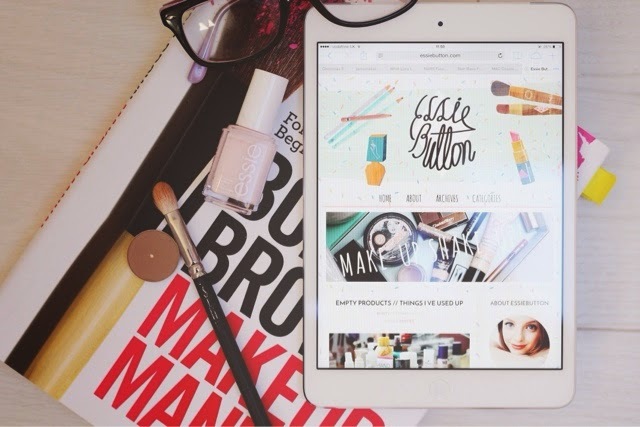 An online beauty magazine created by Kate from Gh0st Parties. Nouvelle offers a whole host of tips and tricks, from beauty, to fashion, to DIY, travel, health & fitness and loads more. I love looking through nouvelle daily for inspiration on pretty much anything. My favourite at the moment are the Halloween makeup tutorials, the edgy half face skull is my fave. Defiantly going to recreate it for Halloween. Finally, I have also been reading the Bobbi Brown makeup manual. I brought this book for my university course and I have been loving it, it has so many amazing in depth tips about the makeup industry from starting out as a beginner to becoming a pro. Highly recommend it for anyone interested in the makeup industry. Thanks for reading, I hope you’ve enjoyed this post and don’t forget to follow the girls over on bloglovin too.